Home Blog When To Go To The Doctor For Fever? The hypothalamus is present in our brain near the pituitary gland. It is responsible for the regulation of our body temperature. The hypothalamus is also called the body’s natural thermostat. The core temperature of our body is maintained within the range of 36-37.5 degrees Celsius. This core temperature may be slightly raised during emotional stress and moderate exercise. Rectal temperature is normally raised during heavy exercise. Fever (also known as pyrexia) is an elevation of body temperature above the normal range of core temperature due to some change in the thermoregulatory mechanism of the hypothalamus. Pyrogen, a substance which is responsible for inducing fever, may be external (outside the body) or within the body. 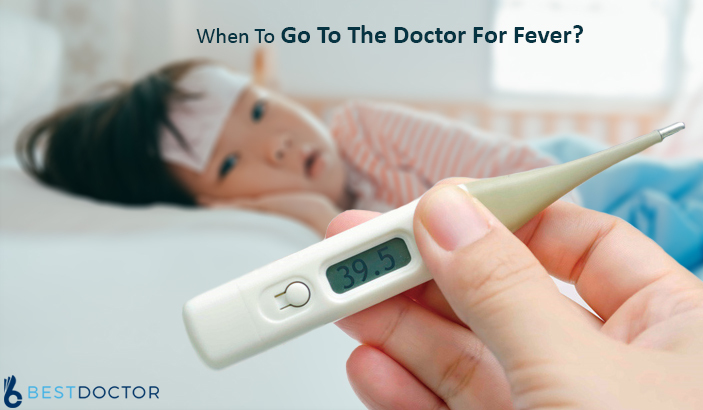 Continuous Fever – Body temperature remains on the higher side throughout the day and does not fluctuate more than 1 degree Celsius in 24 hours. Example – Fever due to urinary tract infections, pneumonia, and infective endocarditis. Remittent Fever – Body temperature remains on the higher side throughout the day and may fluctuate more than 1 degree Celsius in 24 hours. Example – Viral respiratory tract infections, typhoid. Intermittent Fever – Body temperature increases sometimes during the day and remains normal at other times. Relapsing Fever – Temperature remains normal for a few days and rises again. This type of fever can be seen in patients having Hodgkin’s lymphoma. Fever is the most common presenting complaint at every clinician’s office. Most of the patients recover without medications. Yet, there are certain clinical conditions in which the fever does not subside and it becomes mandatory to seek help from a medical professional. The aim of effectively treating fever is to reduce the temperature and facilitate heat loss. It is important to remain equally hydrated while treating yourself for fever. Often, it is a complaint which can be easily managed at home with the help of over-the-counter medication and even home remedies. Continuous Fever Not Responding To Medications – Untreated fever with temperatures more than 40 degrees Celsius can be harmful to the brain. Hyperpyrexia – Hyperpyrexia or hyperthermia is a condition where the temperature rises above 106 degrees Fahrenheit. It is a medical emergency. Fever Along With Persistent and Excessive Nausea, Vomiting or Diarrhea – This suggests a gastric derangement or stomach flu. Excessive vomiting or diarrhea can also lead to dehydration. Fever With Severe Abdominal Pain – Abdominal conditions which present with these symptoms is an infection of the appendix, pancreas, colon or kidney stones. In women, menstrual troubles may indicate a cause within the uterus. Rigors And chills with Fever – Fevers like that of malaria and urinary tract infection are associated with high-grade fever with chills and rigors. Difficulty in Breathing, Shortness of Breath or Chest Pain While Having a Fever – Oxygen consumption by the body increases by 13% with every 1-degree rise in temperature beyond 100 degrees Fahrenheit. A cough With Yellowish-Green Expectoration – These indicate infections of the lungs such as pneumonia or tuberculosis. Rash Over Any Part Of The Body Since The Beginning or During The Course of Fever – Rash indicates eruptive fever which could be contagious, although they are often self-limiting. Bluish or Purplish Discoloration In The Form of Spots or Bruises Without Injury While Having a Fever – Presence of these indicate bleeding through walls of capillaries which means that the platelets are not working optimally. Symptoms such as unconsciousness, neck stiffness, mental confusion, disorientation or seizures, convulsions during fever – This suggests the spread of infection to the brain or spinal cord. Febrile convulsions in children below the age of two years are commonly seen and their incidence reduces with advancing age. Bleeding from any orifice of the body such as while sneezing, coughing, vomiting, urinating or passing stools points towards a major underlying disorder. Fever with swollen and painful lumps or lymph nodes anywhere in the body. If any of the above signs and symptoms get worse along with fever. Fever during pregnancy needs to be reported immediately to your doctor as it can affect the woman and her unborn child. Although fever may seem quite easy to manage, it is important to identify the above signs and symptoms and understand when to go to the doctor for a fever. Next PostHow To Ask Your Doctor For Pain Medication?